The actor who will always be Spock chatted with me back in 2009 about his days with a small LA theater company, The Star Trek Episode, Naked Time plus appearing for JJ Abrams in the Star Trek movie and Fringe. New interview as we look back at season 4 of Fringe and what Agent Broyles dealt with in the two universes. We also chat about his new project, Drone, an SF thriller and his upcoming movie, Won't Back Down. Vintage conversation with award winning author discussing his then TV adaptation of his novel, Flash Forward and his newest work at the time. Music is by Ocean Alexander. Alan Ruck talks to me about his role in Star Trek Gods And Men and rectifying the character of Captain Harriman of the Enterprise B. We chatted about the filming of this collaboration of talented fans and professionals back in 2008. Two vintage conversations with the former SG-1 actor talking season ten of Stargate, the 200th episode and in the second conversation about working with Gail O'Grady in a TV movie and "never" appearing on Sanctuary. The former Terminator T-1000 talked to me in 2009 about his role in Alien Tresspass. We chat about his career and his life. Vintage Interview where she talks Sanctuary when it was a web seriesm plus Stargate Season Ten, and the Stargate movies. I chat with this talented actor about her pivotal role as Celia Flores, housekeeper and keeper of the dead in Fear The Walking Dead. We chat about working with this talented cast including Kim Dickens and a take from a scene between her and Frank Dillane that was never used. Vintage 1996 conversation with one of SF's favorite droids talking Star Wars and the audio dramas based on the original trilogy. In honor of his return to play Luke Skywalker once again in Episode VII here is the entire roundtable session from this summer's SDCC with this engaging actor. Vintage conversation with special effects pioneer who past away in 2013. It was my honor to speak to him about his films and life. Candid conversation of this actor's post Falling Skies life and his musical venture, What The Funk. Interview with Interview With A Vampire and A Company Of Wolves director who talks about his latest Byzantium about two female vampires' centuries long journey. Interview on the film, Maniac with the star and director as they discuss how they made the POV film work from the eyes of the killer played by Elijah Wood. Vintage conversation on his pivotal role as September on Fringe and his role in Stakeland. More of the Star Trek Voyager's candid conversation on bringing Star Trek Renegades to a reality. I chatted with actor prior to the airing of Die Zombie Die about his character, Mack and his relationship with Addy, Plus the actor looks back on his experience in the Twilight movie saga. Special thanks to the Asylum and the SyFy Channel. Buffy Alum talks about writing her new series of books, The Witches Of Echo Park plus acting in Geek And Sundry's Morganville Vampire Series.She also tells me about directing again and her Buffy experience. Visit Funmation's site to get Cowboy Bebop on Blu-Ray. Talented actor who is Alex Kamal tells me about an emotional scene where we get inside his character's feelings towards his family as well as more on season three of The Expanse. Oscar winning special effects make-up artist talks about directing his first feature in Wild Boar. He also reflects on his work on Grimm and his family's connection to the Star Trek franchise. 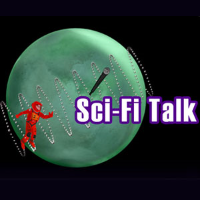 Get the Radio Public app to listen to Sci-Fi Talk. We chat about this character that has gone through many changes in the comics but is finding new life in the SyFy Channel series. We fan boy out on the costumes, sets and Brainiac. Special thanks to SyFy. Actor who grew up in the business talks about his roles in Escape To Witch Mountain films, his role in Fantastic Journey and acting in Star Trek II: The Wrath Of Khan. Insightful conversation with the Dark Matter star on his roguish character of Three and what is ahead this season including a game changing episode. We cover a lot of ground and have some fun along the way too. We chat about this interesting series with its unique world view and its inclusion that totally relates to the cast. Talented actor plays Dr Miles in Displacement, an interesting time anomoly thriller. She also shares memories of working on Christopher Reeve's Superman and an upcoming super villain reunion in 2017. 2007 interview where the actor talks about his role in Final Approach and we chat about Ghostbusters too.